2011 had been a very intense year for me. Some positive happenings, some not so much, but altogether it has meant that I have had very little time for the PVN blog site. Since these events in my life won't be changing anytime soon I have reluctantly decided to close Patricia's Vampire Notes. 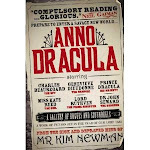 Many of you know that I collect a monthly list of new vampire titles. That will still continue and will be published on the blog site VampChix as well as my Facebook page. Throughout the past few years I have had the privilege of meeting outstanding authors and fabulous readers. I will always be grateful! That is so sad. I hope everything in your life is going to get straight soon! I know I haven't commented much, but I've always read every post in my email. I'll miss you, but I understand completely. I've been in the same boat and will be making some changes too. I'm glad you'll still be posting the list! So sorry to see you leave us.. but you'll still be around, right? Are you going o blog on Vampchix too? It's been great reading your blog, Patricia, and thanks for having me as a guest. I "liked" your Facebook page and look forward to keeping up with you there. I hope 2012 is a better year! Sad to hear this but I totally understand. I have also contemplated closing Amberkatze's Book Blog but I have, even after a stressful year, managed to keep it going. Good luck with everything and you are always welcome to contribute to my blog if you wish to. I am sorry to see the blog go but I want you to know that I have appreciated every post. Thank you! I'm sorry to see you go. I have really enjoyed visiting your site and my must have list of books have increased thanks to your posts! I'll look forward to continue reading vampire books list. Take care and thank you for such a great site. Sad to see the blog go, but you must do what you must do. I will keep on watching for your input at VampChix. Hi, Patricia, I knew you were taking a well-deserved break and I'm glad you'll still be reviewing at VampChix! I had fun listening to your son's band on your family blog today. You will always be tops to me! You were one of the first online reviewers of the genre -- you're one of the best and an inspiration. Life happens and we gotta roll with it. ;) Enjoy your endeavors to the fullest and I wish you all the best. We'll miss you Pat! Take care!! NOOOOOOOOOOOOOOOOOOOOOOOO! I'm very sorry to hear that, Patricia. In the meantime, I wish you all the best with your future endeavours. I also hope those issues are resolved to your ultimate satisfaction. Pat sorry I have been out of touch of late. I only just read at Vampire Wire that you were stepping back from blogging (I understand that from personal experience). Your regular presence will be missed but I will look forward to occasional posts elsewhere. Best of luck tackling your real life issues. It has been a pleasure to know and blog with you. Thank you for your good wishes. It means a lot! I will continue with a monthly list of new vampire titles and post it on VampChix as well as my Facebook page. Best of luck with your blog. it truly is like a second job. A big part of the joy of blogging was working with writers like you and spreading the word about their books. Keep writing and if you have time let me know what you're working on. I've always enjoyed reading your site and I'm glad you have kept it going! Thanks for the invite to join your blog on occasion! It is readers like you that kept me going as long as I did. Thanks for writing! I will be sure to tell Michael how much you enjoyed his music. He's a terrific, talented kid. I can't help being a proud mama. One of the reasons I began blogging was to put out the word about talented writers like you that don't get the big budget, or maybe any budget, treatment from publishers. You know I'm a big fan of your work. Please keep me posted on what your doing. How about that ghost story?? Dear friends, Thanks for sticking with me for as long as you have! Hugs to you both! Thanks so much for your kind words here and on your own terrific site - The Vampirologist! Hi Doug. Yes, I'm down but not out :) I will continue to have a hand in the vampire/UF world in some way or another. SciFiGuy has truly been an inspiration for me as a blogger and as a reader. Although we barely know each other, if you ever want to talk about stuff - especially stuff that caused you to shut down your blog! - feel free to contact me to shoot the breeze and whatnot. I was so sorry to read this. But I understand about personal obligation. I'll miss you, Pat. I hope we'll still see you around the blogosphere from time to time. You have my email addy if there's ever anything I can do for you. In the midst of your own tough times over that sweet puppy Murray you have taken the time to write. Thank you! A huge hug to you! My "pup" is 14, hard of hearing, and is on chemo for cancer. But for now she's doing OK. Each day is a blessing. I will still be haunting the blogosphere from time to time and look forward to reading about your fabulous work. Keep me posted. OMG I just saw this -- sorry you will be leaving but totally understand how "real life" can hamper blogging (it has with mine). Best of luck to you and I'll see you on FB -- you'll need to let me know what you think of The Thing prequel!